Congress President and UPA Chairperson Sonia Gandhi addressed a huge election rally in Sikar at poll bound Rajasthan on Wednesday and launched a blistering attack on BJP for misleading people and spreading lies about the state government. She attributed the credit of the rise of Rajasthan as one of the most developed states of India to Ashok-Gehlot-led Congress government in the state. Congress President and UPA Chairperson Sonia Gandhi addressed a huge election rally in Dungarpur at poll bound Rajasthan. She lauded the efforts taken by the Ashok Gehlot- led Congress govt in the state for the welfare and upliftment of the people in the state and also launched a blistering attack on BJP for levelling baseless charges against the state government. 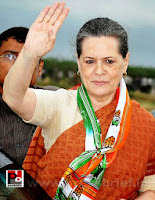 Congress President and UPA Chairperson Sonia Gandhi addressed a huge election rally in Kota at poll bound Rajasthan. She lauded the efforts taken by the Ashok Gehlot- led Congress govt in the state for the welfare and upliftment of the people in the state and also launched a blistering attack on BJP for levelling baseless charges against the state government. Congress President and UPA Chairperson Sonia Gandhi addressed a huge election rally at Meghnagar in Jhabua district of poll bound Madhya Pradesh on Thursday. The Congress President took on the ruling BJP government in the state for its failure to implement the Central schemes. "UPA Govt implemented Mahatma Gandhi NREGA to guarantee jobs to the rural poor and also to curb migration. But did the people of Madhya Pradesh get any benefits? No, because the state Government misused it and issued fraud job cards. The jobs which should have gone to the rural poor were taken up by the contractors". Congress President and UPA Chairperson Sonia Gandhi addressed a well attended election rally in Lunglei at poll bound Mizoram and lauded the efforts of the Congress government in ensuring welfare and upliftment of the common man. Congress President and UPA Chairperson Sonia Gandhi addressed a huge election rally at poll bound Mizoram. While speaking on the occasion at Lunglei in the state the Congress President lauded Congress led government’s efforts for the welfare of the people and development of the state. Congress President and UPA Chairperson Sonia Gandhi addressed a big election rally at Rewa in poll bound Madhya Pradesh and slammed ruling BJP government in the state for its anti-poor policies and corruption. Congress President and UPA Chairperson Sonia Gandhi while speaking at a mammoth election rally at Khargone in Madhya Pradesh slammed BJP for its anti-poor policies and corruption. "You must know that that, nowadays, BJP leaders are dreaming power, even during day time. In their hunger for power, even they fight each other within the party", said Sonia Gandhi and went on further while striking a chord with the huge crowd, "If the BJP leaders think that they can easily make people fools with mere speeches, they are wholly wrong. The people of Madhya Pradesh are intelligent". Congress President and UPA Chairperson Sonia Gandhi is speaking at a huge election rally at Khargone in poll bound Madhya Pradesh. She slammed BJP for corruption and anti-poor policies. The nation on Thursday remembered the first Prime Minister of India, Pandit Jawaharlal Nehru, on his 124th birth anniversary. Vice President Hamid Ansari, Prime Minister Dr. Manmohan Singh, Congress President and UPA Chairperson Sonia Gandhi, Congress Vice President Rahul Gandhi and other dignitaries paid floral tributes at his memorial - Shanti Van in New Delhi. A series of functions are being organised across the country to mark the occasion. The day is also observed as the 'Children's Day' in India as Pandit Nehru had great affection for children. They fondly called him 'Chacha' Nehru. Celebrating Children's Day is about giving children the right to enjoy and grow into healthy and educated citizens of the country. Congress president and UPA Chairperson Sonia Gandhi addressed a mega election rally in Bhilai at poll bound Chhattisgarh on Tuesday and slammed the Bharatiya Janata Party (BJP) government in the state for ignoring development in Chhattisgarh. Counting the achievements of Congress-led UPA government, Sonia Gandhi said that they empowered women by giving reservation to them in Panchayats. "We brought Food Security Bill so that no one in the country remains hungry," she said. Congress President and UPA Chairperson Sonia Gandhi is addressing a mega election rally in Bhilai at poll bound Chhattisgarh. He slammed the BJP govt in the state for lack of development. Congress President and UPA Chairperson Sonia Gandhi assured that Chhattisgarh will develop chathees (36) times better if Congress comes to power in the state. While addressing a mega Congress election rally in Ambikapur in Chhattisgarh, Sonia Gandhi launched a blistering attack on the ruling BJP government and urged the people to help Congress to form a government in the state to take it forward. Congress President and UPA Chairperson is addressing a mega election ally in Ambikapur at Chhattisgarh where assembly polls are underway. She slammed the ruling BJP Govt in the state for ignoring the welfare of the poor and development of the state. Congress President and UPA Chairperson Sonia Gandhi launched her campaign in poll-bound Chhattisgarh on Thursday by addressing a huge election rally at Kondagaon in the tribal-dominated Bastar region. She blamed the BJP government's mis-governance in the state for a rise in poverty here. "You have to introspect whether the state government has given you anything," the Congress president said. Chiding the state government for failing to curb Naxal violence, Sonia Gandhi sought to remind the party supporters that "Congress leaders have sacrificed their life in the fight against Naxal violence". Congress President and UPA Chairperson Sonia Gandhi in Chhattisgrah addresses Congress election rally. NEW DELHI: Congress President and UPA chairperson Sonia Gandhi congratulated the scientists for the successful launch of Mars Orbiter Mission, saying every Indian is proud of this outstanding scientific feat. "Sonia Gandhi has lauded the Indian space scientists for their successful launch of the historic Mangalyaan (Mars craft) Mission. Every Indian is proud of this outstanding scientific feat by our great scientists," an All India Congress Committee (AICC) release said. Sonia Gandhi’s congratulatory message came as the country today embarked on its maiden Mars odyssey with its polar rocket carrying Mars Orbiter Mission (MOM) successfully lifting off from the Satish Dhawan Space Centre in its first- ever inter-planetary expedition in a bid to join a select band of nations. The lift-off of ISRO's workhorse launch vehicle PSLV C25 at 2.38 PM from the spaceport in Sriharikota, about 100 km from Chennai, was witnessed among others by Minister of State in PMO, V Narayanasamy, U.S. Ambassador to India, Nancy Powell, Indian Space Research Organisation (ISRO) chairman K Radhakrishnan and a host of other officials. The mission is aimed at establishing the country's capability to reach the Red Planet and focussing on looking for the presence of methane, an indicator of life, in Mars. European Space Agency (ESA) of the European consortium, National Aeronautics and Space Administration ( NASA) of the US and Roscosmos of Russia are the three agencies which have successfully sent their missions to the planet. Congress President and UPA Chairperson Sonia Gandhi while speaking at the Indira Gandhi National Integration Award function in New Delhi hit out at the RSS and BJP indirectly. “There is a danger from some ideologies, organisations and people who want to divide us”, said the Congress President without naming anyone. The award was given to noted agriculture scientist M S Swaminathan. 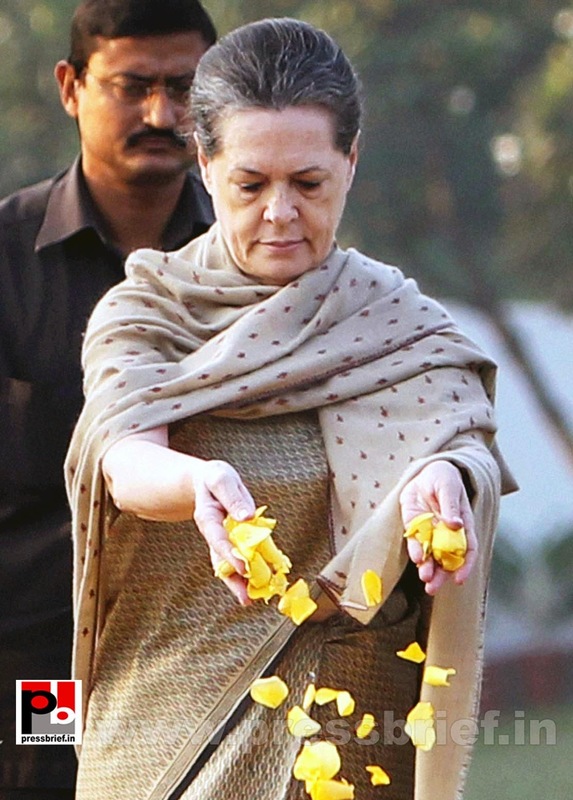 Sonia Gandhi further said, “We have always kept national unity as our top priority. .. We need to remember Indira Gandhi’s courage and her sentiments so that we can fight that fear with conviction.” She also lauded the public sector’s efforts that connected people of various regions in the country. Congress President and UPA Chairperson Sonia Gandhi while speaking at the Indira Gandhi National Integration Award function in New Delhi hit out at the RSS and BJP indirectly. "There is a danger from some ideologies, organisations and people who want to divide us", said the Congress President without naming anyone. The award was given to noted agriculture scientist M S Swaminathan. Congress President and UPA Chairperson Sonia Gandhi while speaking at the Indira Gandhi National Integration Award function in New Delhi hit out at the RSS and BJP indirectly. “There is a danger from some ideologies, organisations and people who want to divide us”, said the Congress President without naming anyone. The award was given to noted agriculture scientist M S Swaminathan. Sonia Gandhi also commented that not much attention is paid to uniting different parts of the country and their people these days. While referring the difficult times of 1960s when India had faced foodgrain shortage and had to import foodgrains, Sonia Gandhi praised Indira Gandhi’s efforts and the role of Swaminatahan in making India self-reliant in the agriculture sector. “During that time too, there were people who would criticise and find faults and there were people who would not have trust. But despite all this, it was achieved well,” said the Congress President. 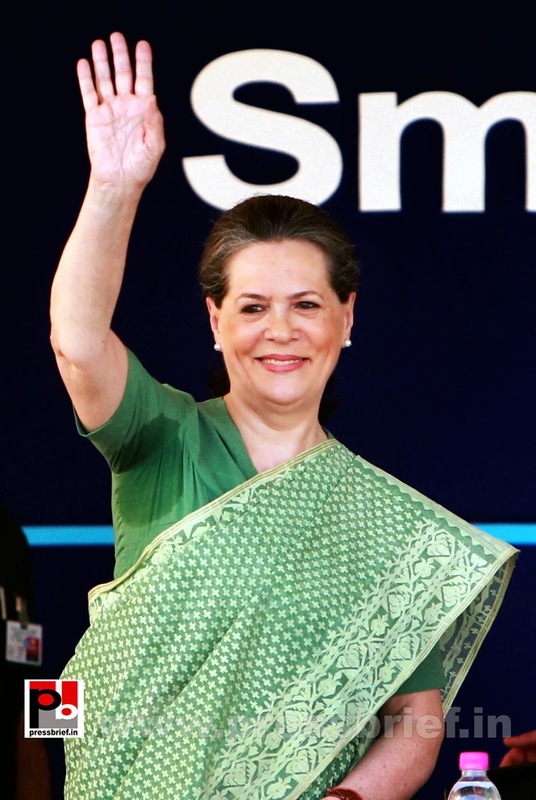 Sonia Gandhi recalled that among the challenges of independent India in terms of national unity was of creation of modern economic situation and institutions with special emphasis on agriculture production and distribution and development of agriculture techniques. The Congress President also reminded that that when most of the states were facing famine, Indira Gandhi took a pledge to achieve self-reliance in foodgrains. While addressing the function, Prime minister Dr Manmohan Singh recalled the late Prime Minister’s contribution in the social and economic development of the masses and said she wanted to take the benefits of development to weaker sections of the society. ““There is a need to follow the path shown by Indira Gandhi as never before. Today, in some parts of the country, attempts are being made to divide the society on the basis of religion, caste and communities,” Singh said.. He added that it would not be wrong to say that India could achieve the Green Revolution due to Indira Gandhi’s leadership and Swaminathan’s efforts. “It was based on this foundation that today we have been able to bring in Food Security Act,” he said, referring to the legislation. In his award acceptance speech, Dr. Swaminathan said when India had to import 10 million tonnes of foodgrain, Indira Gandhi planned creating a foodgrain reserve of the same quantity. He said food security helped India achieve an independent foreign policy. He said India’s help to people from the then East Pakistan and the nuclear testing were a result of its confidence it achieved through food security. "I don't mind if my life goes in the service of the nation. If I die today every drop of my blood will invigorate the nation". In these last words of Indira Gandhi, India’s former Prime Minister, there was courage, belief and faith. Indira Priyadarshini Gandhi, who served as the Prime Minister of India for three consecutive terms (1966-77) and a fourth term (1980-84) was assassinated on 31 October in 1984. The assassination which changed the history of India was said to have been motivated by Operation Blue Star, an attack on Sikh separatists holed up in Golden Temple complex in Amritsar. At twelve years of age, Indira Priyadarshini became the leader of a children’s group, whose purpose was to help end British control in India. In 1938, she joined the Indian National Congress Party, something she always longed to do. In 1942, she married Feroze Gandhi. Soon after the couple was married, they were sent to prison on charges of subversion by the British. Noted for her charismatic authority and political astuteness, Indira Gandhi adhered to the progressive policies of industrial development that were begun by her father, Jawaharlal Nehru, who became the Prime Minister after India won its independence in 1947. As a minister, Indira Gandhi encouraged and started a family planning program. She also promoted the views of Nehru to establish India’s stability and security interests as independent from those of the nuclear superpowers, by authorizing the development of nuclear weapons in 1967. On the international plane too she left her distinct imprint whether as the chairperson of the Non-Aligned Movement or as a champion of environmental protection at various global fora. In all such activities she came in direct conflict with international vested interests entrenched in the West. She was intensely disliked by the prevailing leaderships of the US under Richard Nixon and Ronald Reagan who held her in profound distrust. She endeared herself to almost all the prominent leaders of the newly independent developing states of Africa, Latin America and the Arab world. She was also the leader who transformed India’s chronic food shortages into surplus production of wheat, rice, cotton and milk through the Green Revolution. On Nehru’s death in 1964, Indira Gandhi was elected to Parliament in his place. After acting as Minister of Information and Broadcasting (1964-6), Indira Gandhi became Prime Minister on the death of Lal Shastri in 1966. In 1971, her popularity made her win again by an enormous margin. The second female in the world to hold the office of prime minister, after Sirimavo Bandaranaike of Sri Lanka, Indira Gandhi remains the world’s second longest serving female Prime Minister as of 2011. Indira Gandhi is today best remembered for her ”Garibi Hatao” slogan during the fifth general elections in March 1971, the successful leadership during the 1971 war against Pakistan, the nationalization of all banks in the country in 1969, the ‘Green Revolution’ under her leadership, and the Lenin Peace Prize (for 1983-84) and as India’s first women Prime Minister.